Eric Henderson and William Sigismondi will perform at Neighborhood Church on Saturday, March 24. 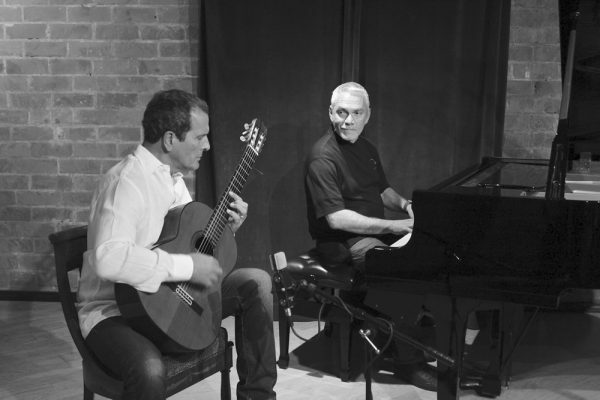 Guitarist Eric Henderson, a protégé of Andrés Segovia, and Venezuelan pianist William Sigismondi, will perform together in concert at Neighborhood Congregational Church, 340 St. Ann’s Dr. from 8-10 p.m. on Saturday, March 24. A fortuitous encounter in Laguna Beach brought the duo together. Sigismondi and his wife Barbara immigrated from their native Venezuela due to its autocratic government and economic and social chaos. Tickets can be purchased by calling the church at 949 494-8061, or Sound Spectrum, 949 494-5959. In celebration of St. Patrick’s Day, the Pageant of the Masters is offering $17 tickets to the 2018 production “Under the Sun” for director’s tier side seating. Order online or by phone with promo code GOLD17. The offer applies to Sunday through Friday performances only. Thank you, Laguna Beach Independent for the great article! Tickets are also available online here.